Adelina Domingues, the oldest person known to be living in the United States, has died at the age of 114. Born in the Cape Verde Islands on Feb. 19, 1888, Domingues died Wednesday at a care facility in the Spring Valley area of San Diego County, her family said Friday. She died in her sleep, during an afternoon nap, said Rebecca Williams, administrator of the Brighton Place nursing home, where Domingues lived since 1995. Though Domingues remained physically active and mentally sharp, her health had declined dramatically over the last month. "I just think at 114, it was just her time," said Deborah Murphy, her granddaughter. Until recently, Domingues had insisted that she was born in 1887, which would have made her 115 and the oldest person in the world. But a search of documents turned up a baptism date of 1888. That, combined with other documents, led the Guinness Book of Records to rule she was 114. The oldest-person title then went to Kamato Hongo of Japan, who was born on Sept. 16, 1887. According to the Gerontology Research Group, the organization which helped authenticate Domingues' age, her death would make John McMorran of Michigan the oldest American. Born on June 19, 1889, he is 113. Domingues was born to an Italian sea captain and a Cape Verdean woman. At 18, she married Jose Domingues, a whaling captain. The couple moved to New Bedford, Mass., in 1907. They raised four children while Adelina worked as a seamstress. Her husband died in 1950 and Domingues moved to Southern California to be near a son, Frank, who died in Palm Desert in 1998. Murphy, the daughter of Frank Domingues, said it was his passing that seemed to hasten the elder woman's declining health. "It was the beginning of the end," said Murphy, of Hookstown, Pa.
"She asked why she would still be alive and have to bury her last child," Murphy said. "That was the hardest thing for her, to still be alive and having buried all four of her children and her husband and brothers and sisters." Domingues' first son died at age 2. Another son and a daughter died as teenagers. Domingues herself never tried to offer a secret for her longevity, though she ate a diet rich in fresh fruits and vegetables, and avoided alcohol and tobacco altogether, Murphy said. "She never took any credit for anything she achieved in life. She always gave credit to God and to his plan and purpose in life," Murphy said. "As a Christian woman, she believed God would call her home at any point in time." As far as her age was considered, her biggest thrill came on the occasion of her 100th birthday, when her picture was featured on the "Today" show and Willard Scott mentioned her name, Murphy said. "That, for her, was really the goal she was looking forward to," Murphy said. Domingues lived on her own until she was 107. She voted well into her 100s, and often wrote admiring letters to Ronald Reagan. "I would say she was a woman of deep spiritual beliefs and passionate in her convictions. She was very proud that she was an American," Murphy said. Depending on the day, she could be lively — singing and chatting in Portuguese — or silent. 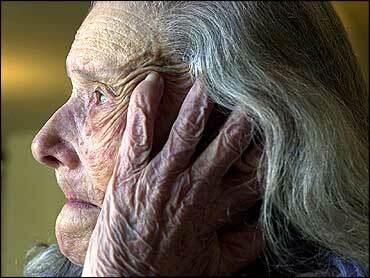 Her only health complaints were failing hearing and eyesight. "She was just our feisty little Portuguese sweetheart," Williams said. "She was quite opinionated, very clear in her wants and needs." Domingues is survived by Murphy and five other grandchildren, as well as nine great-grandchildren. The family plans to hold a memorial service in late August; Domingues' cremated remains are to be buried at a family plot in Massachusetts.